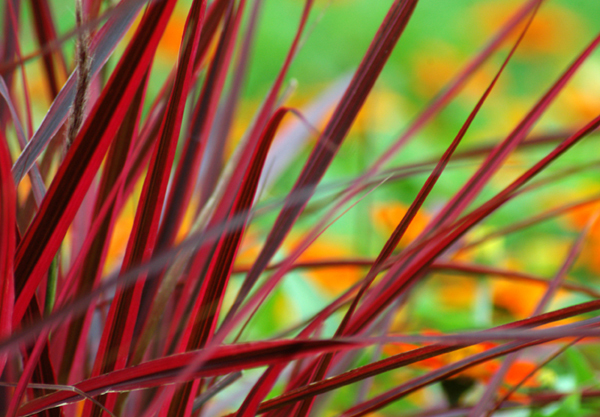 Red ornamental grass makes a bold statement at the Civic Garden Complex in London. I am not sure which type of grass this is – any ideas? These colors are certainly eye catching, Sheila. thank you Wayne – I hope to grow some in my next garden it is so red! Great shot. Love the colors! I’m no expert but that looks like Japanese blood grass. thanks EP – I thought it might be that… but could not find an example with the darker stripes. but perhaps just a variety? Would love to know so I can get some for my next garden. will look again! You’re welcome! Just taking a guess here – maybe the stripes get darker as the grass turns more red. Like I said before – I’m no expert. Good luck! I hope you find what you’re looking for. It’s a beautiful ornamental grass. I love this – the colours are wonderful. I’m wondering whether the grass is a type of phormium or New Zealand Flax. I’ve grown them in the past – mainly the green variety but I think this might be a red species. thanks – a real eye catching plant … thanks for those names – I’ll check them out. It would be nice to have a garden with just different kinds of grass. Great shot – I have no idea what type of grass it is, but it makes for a great image. I love the colours in this image. Beautiful! thank you Lila. It is such a pretty type of grass. Gorgeous photographic capturing. I look forward to other surprises among your photos (I just discovered your blog minutes ago). hey Marso – sorry, I just saw this comment – thank you for following my blog. your comments are always so insightful. Thank you. My comments reflect what I find in your images. Great color and composition. I love ornamental grasses. We have many of the wheat colored ones here. Some have a golden-orange hue to them. thanks! grasses are a wonderful subject.